Of course it is studying CF, but also how CF affects aspects of our lives like exercising, and what can be done to help us. Based on the previous studies I participated in, it proved that CF doesn't just affect our lungs and pancreas...but it affects our vascular functions as well, like blood vessels. 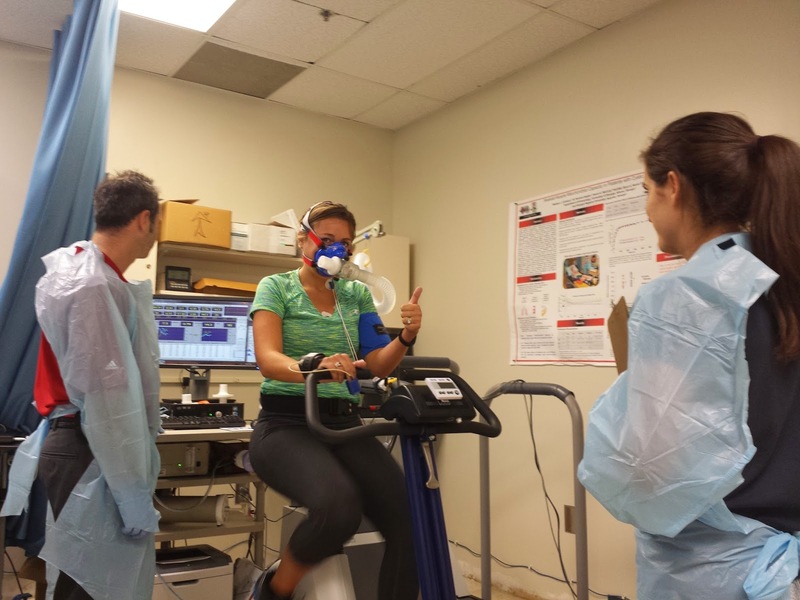 So this study is testing to see if improving blood vessel function will help to increase exercise capacity in those of us with CF. Pretty cool if you as me!! So, where does the Viagra come in? Well, Viagra helps dilate the blood vessels. To answer what you may be wondering...yes, I am going to be taking Viagra (well, the generic form - sildenafil citrate). Here I am on the bike! I go back in 2 weeks and will do the same process again and get the drug or placebo (opposite of what I had this week). I didn't feel anything this week, so I'm guessing I had the placebo...we shall see!! After my next visit, I will be given a 4 week supply of the drug to see if the extended use makes a difference. I'll keep ya posted! The Augusta Chronicle did a write up of the study - check it out here!